More than any other writing, I love reading my students’ narratives. We start the year with narrative for many reasons, but my favorite is that I get to know my students faster than I can get to know them during one-on-one reading conferences or during group activities and discussions. Personal and powerful, all of these stories matter. My goal as a writing teacher is to help my writers harness the words so emotion reigns in the heart of the reader. The problem? Objectives — Using the language of the Depth of Knowledge Levels: Show understanding of the terms abstract vs. concrete; in your independent reading books, identify concrete details and figurative language; analyze the effectiveness of the author’s language; revise your writing to include fresh concrete details and figurative language as you create a text that evokes powerful emotions. 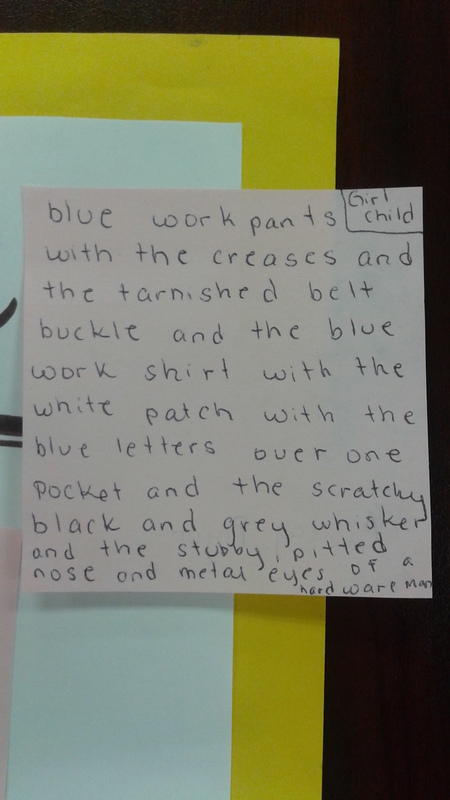 Lesson — Before the mini-lesson, students have already drafted a few pieces, narratives or poems. I usually do the mini-lesson after silent reading time, but for this lesson I begin before because I want to give students a specific purpose for reading. 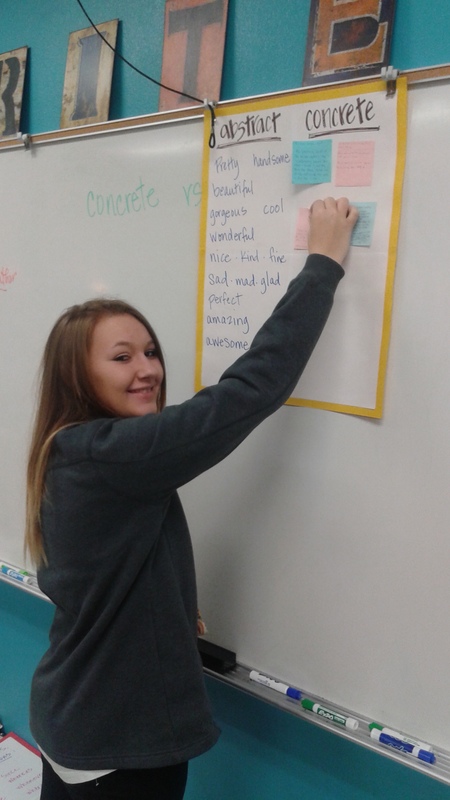 First, I write on the board ABSTRACT and CONCRETE and we review what these terms mean when it comes to writing. I try to use only abstract words as they begin to discuss this with me. Eventually, they will pick up on what I’m doing, and we make a list of abstract words. Then I give each table-group a word and challenge them to come up with a concrete description that shows us that abstract word. They get 1-2 minutes, and then we share out as I write the concrete details on the board. We discuss the difference in how an author can create emotion. Next, I ask students to pay attention to the concrete details in the book they are reading, and I give them each a sticky note. “As you read today find at least one sentence where the author does something really clever with concrete details and/or figurative language,” I say. Students read for 15 minutes, pen in hand, paying particular attention to the author’s craft. When time is up, I ask students to share their sentence in small groups and to analyze the effectiveness of the author’s word choice. “Think about what he’s trying to do there. Why did he mention the color of the sweater, or the smell of the breeze?” If they feel like the author’s accomplished creating emotion, they put the sticky on the board (or as in the photo here –poster). Students need to not only recognize the details and know that they create some kind of imagery, they need to think about how effective the word choice is for what the author is doing at that moment in the story. If I can get them to start thinking about this, I can get them to begin making purposeful choices in their own writing. Follow-Up — When students immediately apply learning we’ve practiced using their personal reading materials, they begin to see the connections between becoming active readers and purposeful writers. This is the kind of lesson I do again and again with a different literary or grammar skills students to master. Next up: subordinating conjunctions.